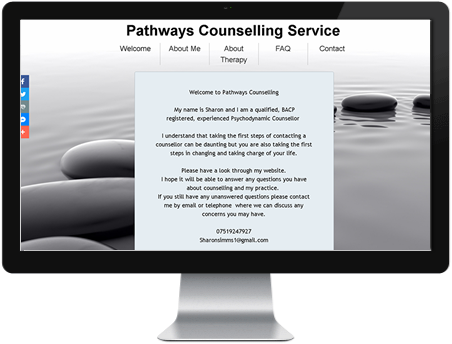 My name is Sharon and I am a qualified, BACP registered, experienced Psychodynamic Counsellor. I understand that taking the first steps of contacting a counsellor can be daunting but you are also taking the first steps in changing and taking charge of your life. Sometimes we can not explain or understand why we are behaving in a certain way and these confusing feelings can make us feel isolated and unable to talk to those closest to us. Therapy offers a sensitive, confidential, non judgemental, safe space where you can be supported whilst you explore any difficulties you may be experiencing. A place where your thoughts and words will be treated with dignity and respect. Counselling provides an opportunity to meet each week and explore your difficulties and feelings. It is important that you find the right therapist, one that you are comfortable with, able to provide you with support and that understands how you are feeling. With this in mind, I offer a reduced cost 50 minute initial appointment session to allow you to ask any questions you might have, for us to get to know each other and see if counselling is right for you at this time. I currently have practices in Godstone and in the town centres of Coulsdon, and Redhill. I offer confidential long and short-term counselling and psychotherapy in a range of days and times to accommodate busy lives. I Qualified as a Psychodynamic Counselling at the University of Surrey, and have been working in the local community for several years with individuals experiencing a wide range of difficulties. I am committed to ongoing professional development, adhere to BACP ethical guidelines and regularly complete further professional training. I am experienced in working with Depression, Anxiety, Panic attacks, Panic disorder, Anxiety disorder, Low self esteem, Relationship issues, Bereavement, Post- natal depression, Loss, Separation, Divorce, Adoption, Addiction, Self-harm, Sexual abuse, Work related stress, OCD, anger issues. Although I mainly work from a Psychodynamic perspective, I believe that we all have our own unique life experiences and difficulties as we enter therapy. With this in mind, I work using a range of models so that sessions are tailored to support you, the difficulties you are currently experiencing, enabling you to find a way to move forward.